Bunnies, Candy, Eggs. All the things I think about when it comes to Easter. The biggest question I always have at the end of the day is what to do with all the hard boiled eggs? Usual we make about two to three dozen eggs just to decorate, but this year, I got a little more creative and planned a head with one of our Easter Brunch dishes. 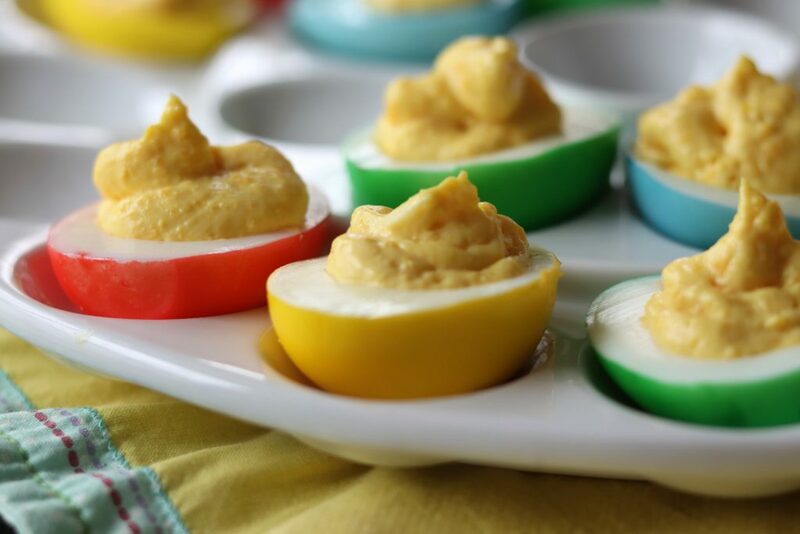 Deviled Eggs are a staple at our house for most occasions. Everyone has an opinion on how to make them too. Heck, everyone has an opinion on how actually to hard boil eggs! For the record, I like to bring mine to a boil with a big pinch of salt and a splash of vinegar. Let them rapid boil for 5 minutes, and then pull off the heat and sit for 10, then dunk directly into a ice bath. Perfect eggs every time. 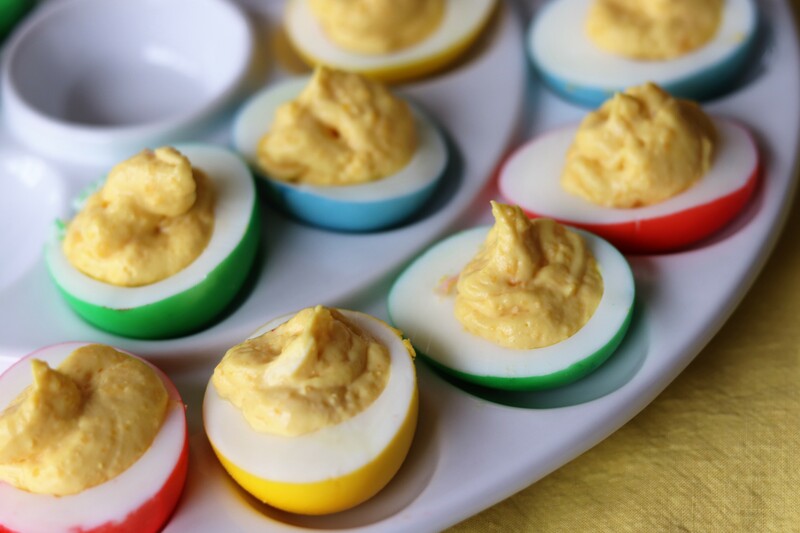 This year instead of making you boring white deviled eggs, try my easy dyed eggs this year for a gorgeous table view. 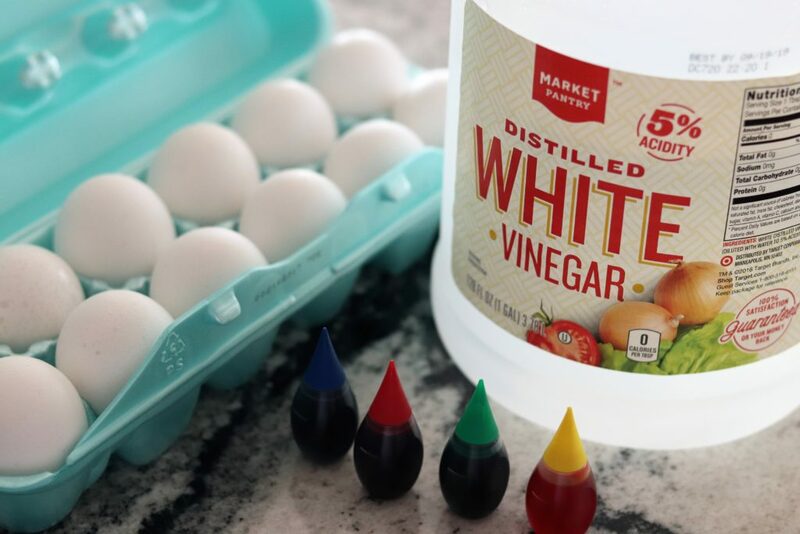 Dying eggs for brunch couldn’t be easier. You’ll need 4 cups, 4 tablespoons of white vinegar and food coloring. I opted to use food coloring dye that I picked up at the grocery store. 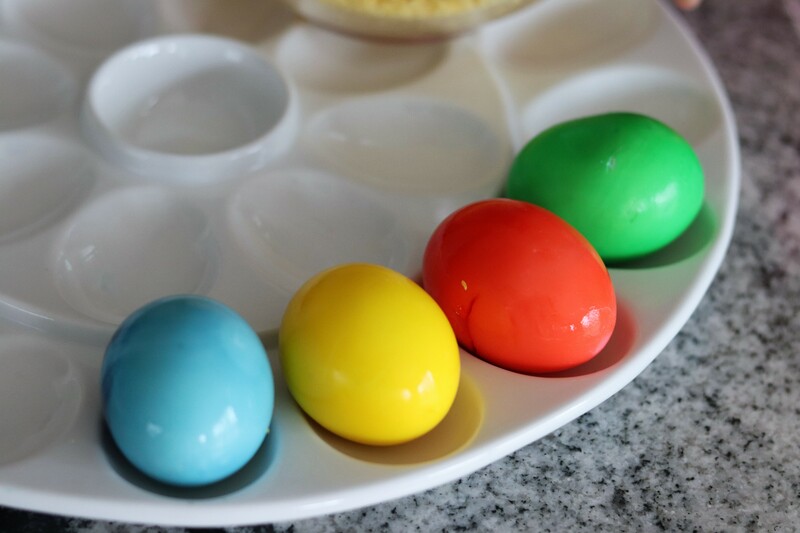 You could also use the Egg dying kit, but this was super easy and I had the color on hand. I also used a throw away plastic cup and plastic spoon to make clean up easier. All you’ll need to do is do 5-10 drops of food coloring into 1 tablespoon of water and about 1/4 cup of water into each cup. You can get creative on how light or dark you like your color by adjusting the number of drops and how long they sit in the coloring. I let mine sit about 10 minutes with 10 drops, but I was going for bold eggs. Then once you have the desired color, I will do a quick rinse to wash off any excess vinegar and let them dry. Then just slide the eggs lengthwise scoop out the yolks into a seperate bowl. Mash the yolks until they are no longer chunky and then add 1/2 cup mayo and 1 TBSP yellow mustard. Mix well to combine. You could also use a food processor here and reallly get it creamy. Then from here, you could easily use a plastic storage bag and fill and pipe the mixture or just use a spoon and fill. However fancy you like to get.